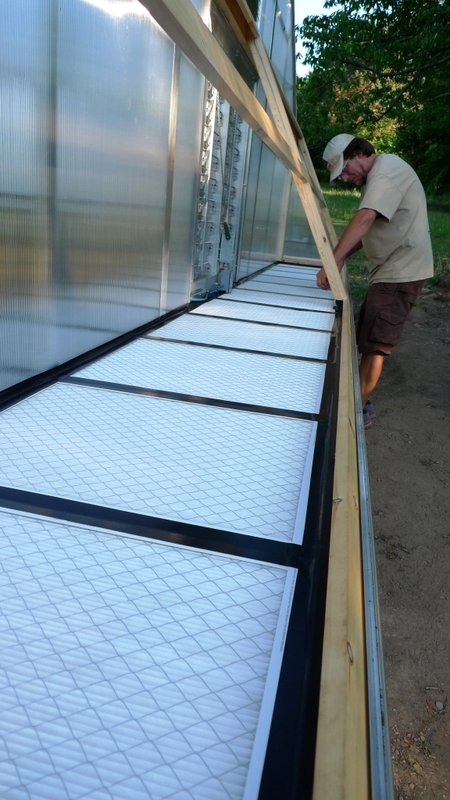 The purpose of this project was to see if the concept developed and demonstrated in 2009 to block disease spores from entering a small enclosed tunnel using a fan and anti-allergen furnace filter could be scaled to a full size 100 ft by 26 ft. high tunnel. To test this a standard Rimol,Noreaster, High Tunnel was modified to operate under a slight positive pressure by reversing the normal direction of the exhaust fan to draw air into the tunnel through a bank of 15- 20X25 inch 3M Filtrete Allergen Reduction Filters. A 2-speed fan at low speed moved 6500 cubic feet per minute and at high speed 13,300 cubic feet per minute. Disease risk in our area was monitored using the NC State University disease prediction models and the IPM Pipe network. 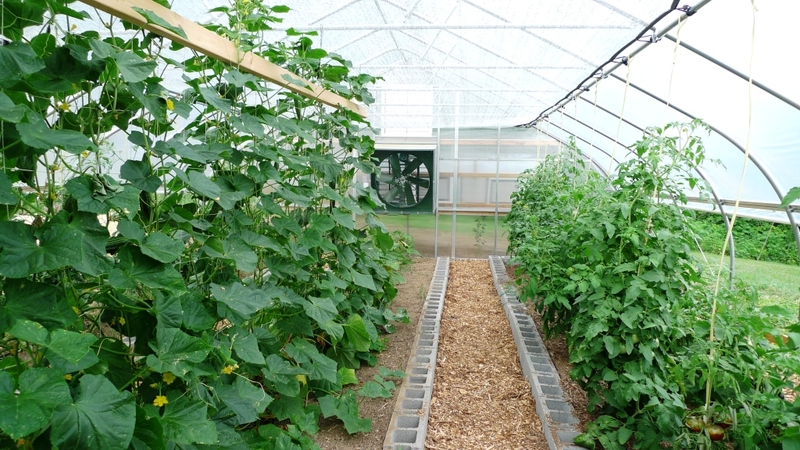 When disease infections of cucumber downy mildew were imminent in early August, the high tunnel was put in the spore exclusion mode by rolling the side curtains down and turning on the fan. Temperature and Relative Humidity was taken and recorded in the tunnel during one of the hottest days. Control plantings were established outside the tunnel and in an adjacent identical tunnel without spore exclusion. 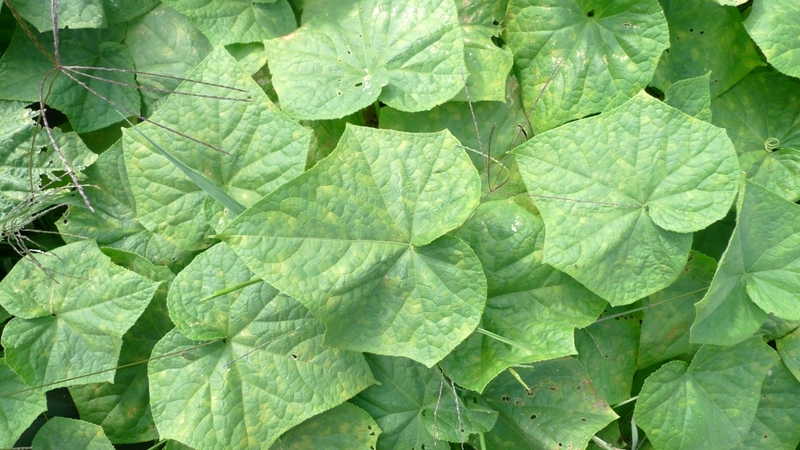 In late August a Downy Mildew infection occurred killing the outside cucumber plantings and a week later the plantings in the conventional tunnel. No infection occurred in the spore exclusion tunnel. It was observed that plant growth of tomatoes, peppers and cucumbers was exceptionally vigorous and productive in the spore exclusion tunnel as indicated in the picture of the operating Spore Exclusion Tunnel(Figure 12). In this picture the input fan and filter bank can be seen to the left at the end of the tunnel. 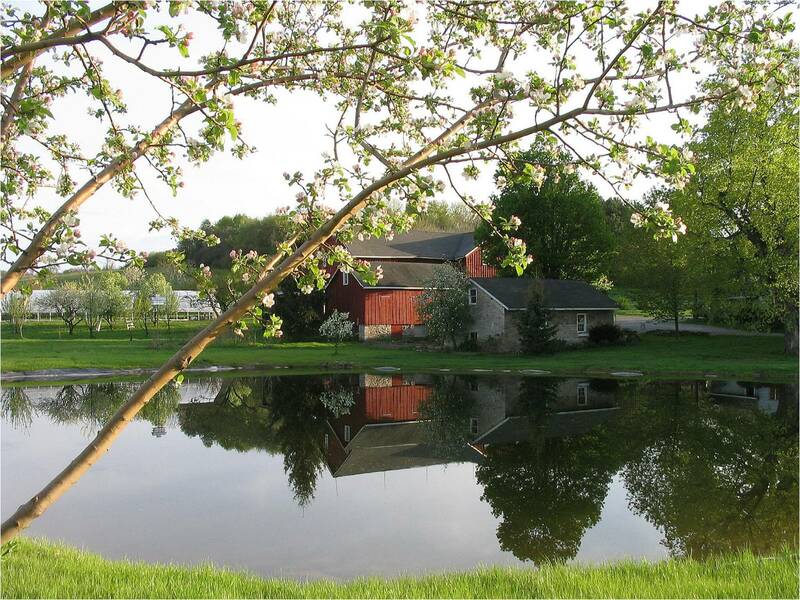 Elderberry Pond is a 100 Acre certified organic farm. In any year we have about 35 acres of certified organic fruits, vegetables and pastures. Our mission at Elderberry Pond is to use the farm as a model of how sustainable agriculture can operate to fuel local food systems. The farm is operated by my wife and I and our son Christopher. We hire a few summer students and interns to work with us during the summer months. We market our produce and meats through an on-farm country food store, at local farmers’ markets and through a fine dining restaurant, The Restaurant at Elderberry Pond, which is located in a woodlot overlooking the farm. The farm produces a very wide variety of produce and meat to meet the needs of the store and restaurant. All of the salad greens, vegetables, potatoes, dessert fruits and many of the meats for the restaurant are grown on the farm. 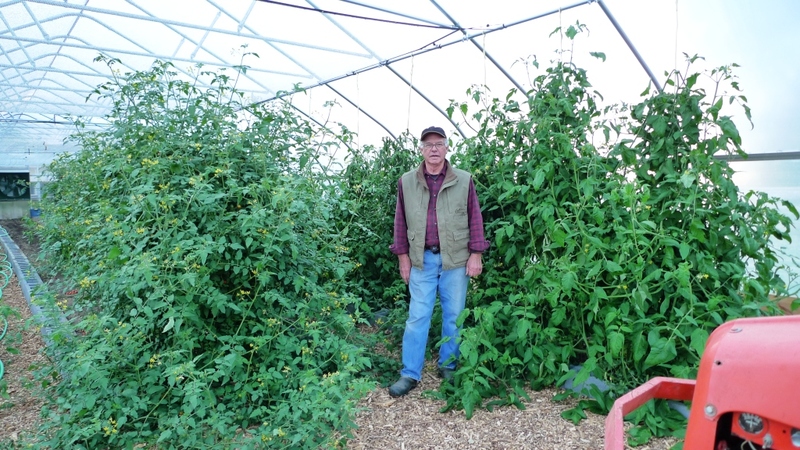 In recent years we have added two 96 X 26 foot high tunnels for season extension and improved quality produce. The project was carried out by me with help from our seasonal workers. Abby Seaman from the Cornell University NYS IPM Program was my technical advisor. Abby advised on area disease issues during the summer and visited the experiment to observe plant disease status. The goal of this project was to determine if a large, 96 ft. by 26 ft, high tunnel could be operated in a mode that would exclude spores from Downy Mildew and perhaps from tomato late blight. An earlier experiment was performed on a small 30 ft. by 5 foot low tunnel(Figure 2) which indicated that Downy Mildew spores could be excluded by drawing air into the tunnel using a fan to draw air into the tunnel through a high performance electrostatic furnace filter. The results of this prior experiment were dramatic since 2011 was a year of severe cucurbit DM infection, and the spore exclusion tunnel was surrounded by control beds that were totally infected. This project would scale the tunnel size and filter bank size to a full size high tunnel. Could the tunnel be cooled when fully closed during predicted infection periods on hot summer days? Would a standard high tunnel fan be adequate? Could the fan draw enough air through the required sub micron filters? Would there be a problem with high humidity due to excessive trans-evaporation in a high heat enclosed environment? Would there be enough positive pressure in the tunnel to prevent spores from entering when closed, but not perfectly sealed. What about when the door was opened for entry and regress? And finally, and most importantly, would the cucumber and tomato plants grow well and be free from Downy Mildew during periods when these diseases infected plants in open outdoor beds and in a standard high tunnel of the same size operated in a normal summer time mode i.e. no filtered air? 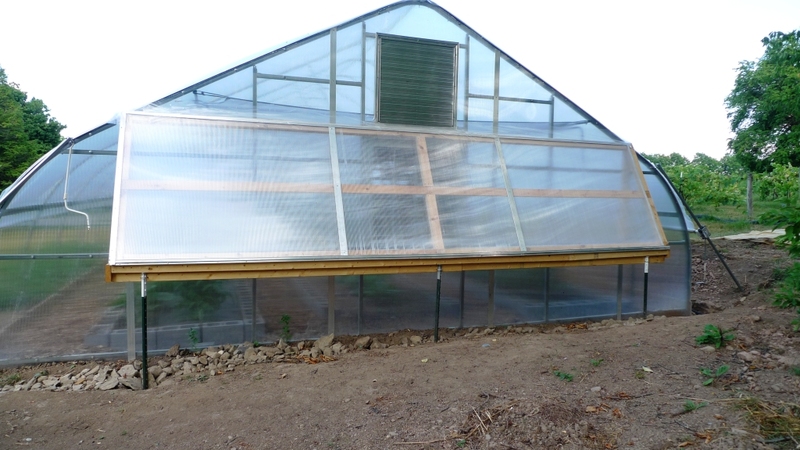 The construction of the New High Tunnel began in May. The new tunnel was funded by Elderberry Pond to be used to conduct this NE-SARE Funded Spore Exclusion Experiment. The site for the tunnel was selected to have access to irrigation from barn roof rainwater, and to have a wooded area close by to draw cool air through the filter bank into the tunnel. Both of these factors turned out to be important in this particular summer which was the driest and hottest on record. Once the tunnel was constructed, on June first, work began on getting the raised beds in place with soil amendments and irrigation lines. Soil samples for the new tunnel as well as the old standard tunnel and the outside control beds were sent to A&amp;L Eastern Labs. Since DM infections from southern winds were not expected until July or August, it was possible to get plantings of cucumbers, tomatoes and other crops in before beginning work on the spore filtering and tunnel pressurization system. 1. The air could be drawn through the filter bank. 2. The tunnel could be designed to always have a positive pressure inside so that any leaks would have air blowing out, not in, and no spores from outside could be drawn in. 3. The air entering the tunnel could be from the cool wooded end of the tunnel. During the design phase it was decided to use a two speed 3/4 hp electric fan. On low speed the fan would draw about 6500 cubic feet per minute of air through the filters and into the tunnel. This was enough volume of air to replace all of the air in the house every three minutes. This was fine for normal operation with sides down and entrance doors closed. A higher speed of 13,300 Cubic feet per minute could be used when the small entrance door was to be used or during high wind storms that might occur during predicted infection periods. At this speed the air would be replaced in the tunnel every 80 seconds. Although this fan was over double the price of the proposed single speed fan, it eliminated the need for double entrance doorway. To confine the hot air to the top of the tunnel and keep the cooler filtered air in the plant zone a heat reflecting aluminet fabric was placed along the length of the tunnel at the 8 foot level. It was felt that this would work better than the 3 foot diameter tube that was originally planned since it would reflect more of the sunlight into the warm air zone. This warm air was forced out through a louver at the entrance end of the tunnel by pressure from the filtered air fan. One of the most difficult design tasks turned out to be determining the number of furnace filters that would be needed for the filter box that went across the back of the tunnel. While there is much data available on the filtering characteristics of the standard 3M Filtrete Max Allergen filters, there is little available on the resistance to air flow of these filters. To make matters worse the resistance of these filters changes dramatically with the rate of flow. We knew from our previous tests on the low tunnel, and on measurements of spore size that we needed filters that would block particles about 1-3 microns in size. The filters selected were the same ones used in the previous low tunnel test The MPR, Micro particle rating of these filters is 15oo and the MERV, minimal efficiency rating performance value, is 13. The filters were available at Lowes home improvement store for about $14 each. Bases on our air resistance estimates 15 Filters were used in the filter box that went across the back of the house. The Spore Exclusion Tunnel operated as well or better than expected. The fan at low speed kept a positive pressure in the tunnel at all times when the risk of spore infection was predicted and the tunnel side walls were put down. At high fan speed the entrance door could be opened and a rush of air blew out preventing outside air from entering. Our big fear of the tunnel getting too hot and cooking the plants was not a big problem. In fact the temperature data recorded on the same day in both the spore exclusion house with the sides down and the conventional house with the sides rolled up were close, with the closed spore exclusion house only about 5 to 10 degrees warmer than the open conventional house. We believe this relatively small difference was due to the input of cooler air from the wooded area near the fan intake. The temperature data (collected from battery operated omega data loggers) for both houses was taken on a 90 plus day (August 11th.) Data was recorded every 10 minutes for a 24 hour period and is shown in Figures 6 and 7. The dips are due to passing clouds. For Relative Humidity the data taken every 10 minutes over a 24 hour period was very similar with both houses having a relative humidity of about 25 percent during the heat of the day and about 60 to 90 percent at night. As mentioned, in the beginning of July we began checking the IPM Pipe Cucurbit Downy Mildew Forecasts daily. Reports were already coming in from Northern Pennsylvania. On July 18 the first report in New York was confirmed in Suffolk County. On August 4th a warning of probable infection in upstate New York was issued(Figure 8.) The red areas are areas of highly expected infection. On this date we closed down the tunnel and began to operate in the spore exclusion mode. On August 8th a field in Seneca County (about two hours away)was confirmed to have a DM infection on cucumbers. On August 20th we observed a severe infection of our outside cucumber planting, but none in either Tunnel. We reported the infection and sent leaf samples to NC State for confirmation. The next day NC State confirmed the infection and posted it on the CDM alert system. There were no additional infections in either tunnel until early September, probably in part due to a lack of rain to deposit spores. On September 9th Abby Seaman, our technical consultant, discovered an infection on the cucumbers in the conventional tunnel, and took leaves for confirmation. The second plantings on the outside plantings and in the conventional tunnel had subsequent infections. NO INFECTIONS OCCURRED IN THE SPORE EXCLUSION TUNNEL THROUGH OCTOBER, AT WHICH TIME ALL PLANTINGS WERE REMOVED. There were no late blight infections on tomatoes in either tunnel or in field plantings. Figure 9 shows the first infection on the outside control planting. It is in this area that the most dramatic results were observed. 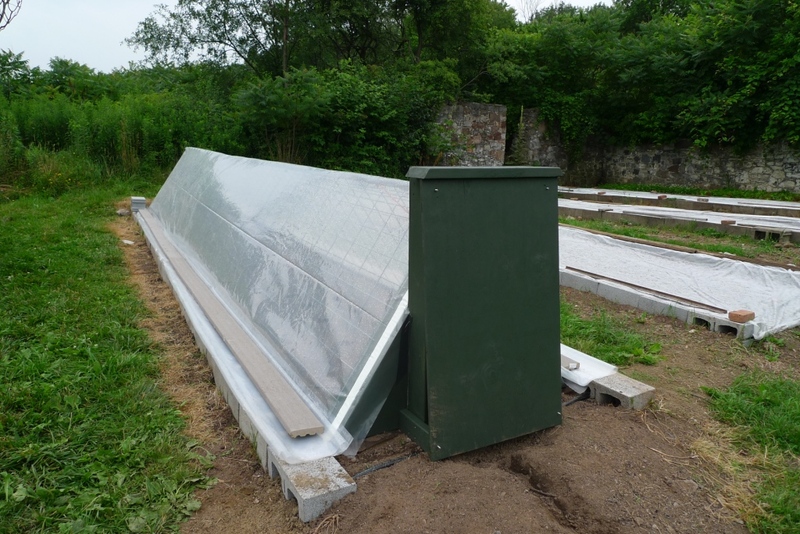 All of the vegetables planted in the spore exclusion tunnel grew faster than in the conventional tunnel and showed little or no sign of any disease. Soil samples from each house indicated better soil in the older conventional house, probably due to four years of compost addition etc. Even the soluble salts were about the same in the two tunnels. 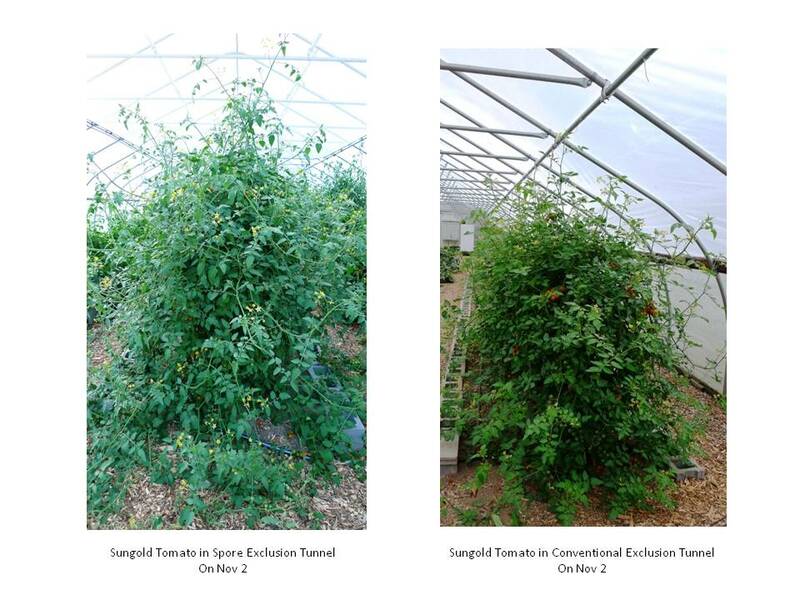 The tomato plants in particular were dramatically bigger and higher yielding in the Spore Exclusion House as shown in the November 2nd comparison of figure 9. The reason for the difference in plant vigor in the Spore Exclusion house vs. the conventional house is not known. 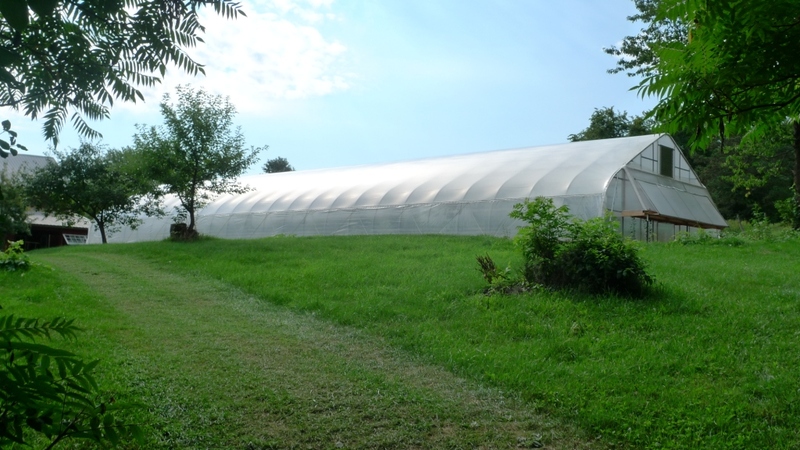 Compared to a conventional High Tunnel with the sides up throughout the summer there are several differences in initial and on-going operating costs and in production effectiveness. 1. Initial cost is slightly higher for the spore exclusion tunnel due to the cost of the filter box. Construction of the box with the filters in this project was about $400 not including the fan, which we would include in either a conventional or spore exclusion tunnel. This included the frame, cover materials and labor to construct the box. Because you do not need or want temperature controlled louvers in the Spore Exclusion House there is a savings. Louvers that are just controlled by interior tunnel pressure are about $100 to $200 less than motorized ones, so the total cost differential may be only a hundred dollars or so out of 12,000 dollars. 2. Power for the fan, which must run during a predicted high risk infection period when the sides are put down and the fan is turned on, is an additional operating cost. For this project the fan was run at low speed day and night from August 4th until September 20th. Only when the door was opened or during a high wind event was the fan operated at high speed. The cost of running the fan at low speed is about $1.80 for a 24 hour day at the cost of our power. For the summer the cost was about $85. For a conventional tunnel there would be the labor and material cost required for spraying copper several times during the summer. Given that the copper might not work, and that there are some potential risks to plants and operator I would judge the fan to be a good alternative at somewhat lower cost. To evaluate the value of the cucumber crop production both the conventional tunnel, the spore exclusion tunnel and the outside control planting had about 15 feet of trellised cucumbers(Figure 11). From about July 20th until Early September both the conventional tunnel and the spore exclusion tunnel produced about 16 pounds of cucumbers a week from the 15 foot long trellised plantings. The outside planting produced only about half this amount during the most productive period and all production ceased on August 24th when the plants had been killed by a severe downy mildew outbreak. The conventional tunnel continued to produce for about two weeks until DM destroyed that crop as well. The cucumber plantings in the spore exclusion tunnel continued to produce through early October. So the production rate in the two tunnels was about the same and well over double the outside control planting. It was only the extra month of production in the Spore exclusion tunnel that increased the overall production in that tunnel. As will be discussed later under conditions, this year had a late first infection period. In the previous low tunnel test year the first infection in our area was in mid July, and in the next year, 2010, the first report in our area was in late June! Had this happened this year there would have been no production from either the outside planting or the conventional high tunnel. So spore exclusion could in a given year make the difference from good production to no production at all. In some ways it was a good year to carry out this project. It was the hottest and driest year on record and heat and adequate moisture in the enclosed spore exclusion were of great concern. These two factors did not turn out to be a problem. There was a definite recorded Downy Mildew infection period, but it was later than and not as severe as in other years, and that made the results of the test less dramatic than they might have been. The infection events in 2009 and 2010 were earlier and far more devastating. Figure 11 – Cucumbers (Left) in the Spore Exclusion House in Early August. During the spring summer months we have Sunday afternoon farm tours as well as classes on organic and sustainable farming techniques. The spore exclusion project was of high interest at these classes and on these tours. We also were interviewed last month for an article in the NOFA-NY News about on-farm research, where the Spore Exclusion Tunnel was described in detail. We have submitted a paper for presentation at the PASA (Pennsylvania Association for Sustainable Agriculture) winter conference in February, 2013. We will present the results of this project at the Cornell Organic Growers Meeting in February and at the Cornell Organic Cropping Systems advisory meeting on December 6, 2012. We will definitely continue to use the spore exclusion high tunnel as an integral part of our farm production for both cucumbers and tomatoes. In a year with either early downy mildew infections or tomato late blight infections it could be the difference between having a great crop or having no crop. I do not believe any adjustments to the operating system are required. It worked well during a summer of extreme weather. I believe the spore exclusion high tunnel would be a good addition to any diversified vegetable farm or even to a farm focused on a few crops like tomatoes, cucumbers or melons. I would hope this project encourages other farm to try spore exclusion tunnels and will be proactive in spreading our results. A possible next step would be to make the tunnel operate in a passive mode with either solar panels or with a chimney to aid in air circulation, without introducing spores into the tunnel environment.